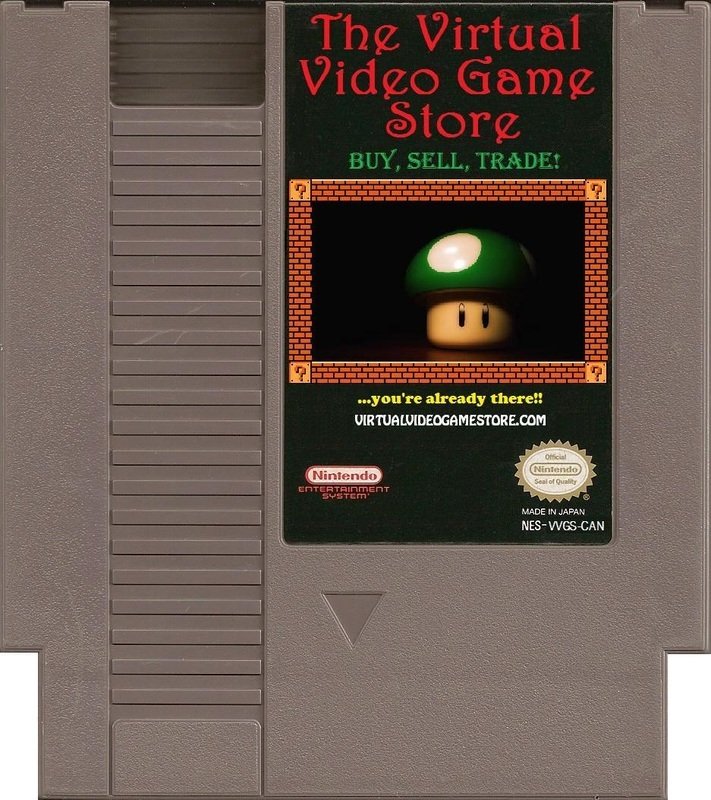 The Virtual Video Game Store! Your interactive shop for all things video game, New and Used! Retro and Recent! NOTICE: VVGS stock is now mostly available as we get ready to reopen soon. Please allow Pop-ups from the store on your browser. Pop-up blockers may affect the functionality of the store and/or email. Join our mailing list today for exclusive offers and deals that will only be available to email members! Welcome to The Virtual Video Game Store! We're located in Kitchener-Waterloo and we sell locally AND worldwide. We're your online shop for all things video game related. New and old*, retro and recent! Come right in and browse our awesome selection! With the Virtual Video Game Store you can have it delivered** right to your door (locally and through mail) ...all while shopping from your home, tablet, or cell phone! Or, if you're local, and you don't want it delivered**, we can arrange for a free pick-up. In addition to our delivery service, we can also pick-up your game trade-ins or games you want to sell, locally in Kitchener, Waterloo, Cambridge and Guelph (and surrounding areas). We accept credit cards and PAYPAL on the site so you don't have to handle cash, but cash IS also accepted and paid upon delivery or pick up locally, just click contact and let us know what you want to buy. Get rid of all those headaches that come with buying and selling used games and make it easy! It's not just online shopping, it's a like having a Video Game Store in your home, or pocket ...a VIRTUAL Video Game Store! Got any games you'd like to sell or trade-in? Need some extra cash, or games? Not only do we sell, but we also buy and take trade-ins on games for almost every system. Our trade in prices are very competitive with other stores and we can pay you with cash or PAYPAL! If you have any questions, please check out our F.A.Q. We hope you enjoy our store, service, products and overall experience. If you do, please help make the store even better by continuing to support it and please share the store and our facebook page, with your friends and family. Your support is truly appreciated. You can also support the store by "Sharing" it with your friends and family on Facebook. ...or send them a GIFT CERTIFICATE, they'll thank you!!! ​You can buy one at the bottom of this page or at the top of any category page. Happy Shopping and Game On! *Although we do our best to be as accurate as possible in our descriptions, the images, videos and pictures used were not created by the store and do not represent the quality of the actual product we are selling. They are strictly for informational use, and may differ. Just ask for any specific details. **Delivery + Pick-up availability may vary, delivery/pick up extra, minumum $20 purchase for delivery. Delivery charge non-refundable. -most of the store inventory is used, (unless specified) therefore any online codes may have been already used. If you have any concerns about condition, please feel free to contact the store and we can tell you more about the product. Cartridge games are generally "cart only" unless otherwise specified. By using this site you are agreeing to the terms and conditions of the VirtualVideoGameStore.com, ...which can be found on our "Info and Services" page.